Meet Epson’s next generation, cartridge-free printer. This 3-in-1 with Wi-Fi Direct is easy-to-use, compact and offers double-sided printing. Designed for your convenience, this cartridge-free EcoTank ITS printer comes with up to three years' worth of ink included. Providing a fantastic solution for busy households, this reliable and easy-to-use model features an enhanced ink filling system and new ink bottles engineered to minimise the risk of spills and mess. It also includes a 3.7cm LCD screen, an SD card reader and double-sided printing..
Go longer between refills with this EcoTank ITS printer. 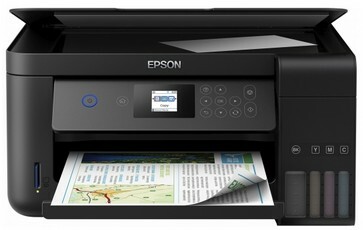 It uses ultra-high-capacity ink tanks to completely remove the need for cartridges. With a Micro Piezo printhead, EcoTank provides a reliable printing solution. Three whole years1 – that’s how long you could go without buying more ink for the L4160. Giving you an extremely low cost-per-page, it produces up to 14,000 pages in black and 5,200 in colour with the included ink. 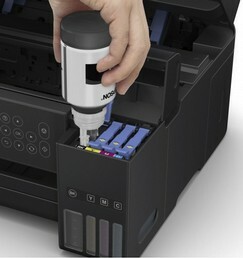 Next generation ink filling system: Enjoy hassle and mess-free refills with the enhanced ink bottles.